Over one thousand of our pumps are in service around the world. FAR Products, Inc. has been committed for over 45 years to our customers and we continue to design new products to lead the way in pumpouts, allowing marinas around the world to have the best product available. All within one compact unit, the "Jonny Trap"™. JONNY TRAP 6000, 7000, and 8000 models have no pulsation unlike other types of pumps, which have a tendency to be noisy and vibrate violently. In addition, the Jonny Trap™ is engineered to give maximum flow for horsepower of any pumpout. These units are virtually maintenance free. The motor and pump are direct coupled so there is no misalignment between internal parts. Best yet, due to the compact design, Jonny Trap™ will save you valuable space where-ever you install it. Fluids in the Jonny Trap™ 6000, 7000, and 8000 models will not pulsate! All internal parts are crafted from non-corrosive stainless steel materials. All Jonny Trap™ pumps are built as a positive displacement and self-priming unit which produces no vapors , odors, or hazardous gases. Additionally each unit is self cleaning. 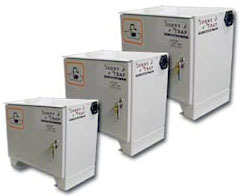 All Jonny Trap™ units are contain a vacuum system which can rid fluids and sewage to a direct disposal unit at a distance of 2000 feet. The pump is enclosed in a NEMA 4 enclosure which is not subject to environmental hazards or contaminates unlike other manufacturers units. With no level indicators to malfunction, you do not need to worry about overflows or running non-stop until you turn the pump off. Best of all, you have no micro controllers, no transistors, or electronics to adjust. No need to use standard design or for specific needs, shapes, or sizes to pumpout. FAR Products, Inc. provides custom units to meet the needs of any customer demand. You also can choose from Jonny Trap's standard models, in stock, which range from 7 Gallons per minute up to 232 Gallons per minute. The pumpout units install with ease and have no electronic controller or level indicators to worry about malfunctioning. Marinas have been purchasing Jonny Trap™ pumpout units for nearly half a century. Those who buy a Jonny Trap™ pumpouts are committed to keeping the environment and our water ecosystems clean. They know only a Jonny Trap™ can attract new customers to their marina. FAR Products, Inc. has been producing Jonny Trap™ pumpouts with many different pumps and will size the pump for custom needs. Jonny Trap™ pumpouts have unique characteristics that make them out-perform all other pumpout systems. Distances up to 2000 ft. Weight 100 lbs. 160 lbs. 240 lbs.